The Peoples Democratic Party (PDP) has declared its platform open to all Nigerians interested in contesting for various positions, including the presidency, in 2019. Consequently, the party said none of its organs is permitted to align with any particular presidential aspirant ahead of next year’s polls. 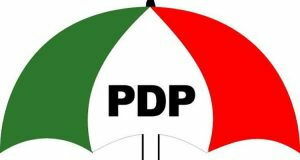 National Chairman of PDP, Uche Secondus, in a communiqué jointly signed by Chairman of PDP Governors Forum, Governor Ayo Fayose of Ekiti State, declared: “We commend members of our party for their unalloyed support. We reiterate that our repositioned party is prepared for the 2019 elections and will ensure that all Nigerians aspiring to elective offices are free to contest on the platform of the PDP. PDP National Publicity Secretary, Kola Ologbondiyan, in a statement, yesterday, disclosed this was part of decisions reached at the Asaba NWC meeting. Ologbondiyan said the PDP condemned wanton killings across the country and urged President Muhammadu Buhari to take decisive actions to address the situation. “We strongly condemn unabated killings across the country. We call on Mr. President to come out clean on herdsmen killings and address the nation on how to end the carnage. The president must take responsibility on the protection of life and property, which is the most important of his responsibilities. “We believe that the federal government’s decision to set up a committee, to address issues of herdsmen killings, is a pretentious approach to a matter that requires firm action and leadership by the president, in line with his oath of office; to protect all Nigerians irrespective of creed, tribe and political affiliation. “The PDP has been the author of restructuring and this was further expressed in the report of the 2014 National Conference. The APC, as a latter day convert of restructuring, is merely paying lip service to a matter of national importance. However, we have mandated our members in the National Assembly to, immediately, commence the process of initiating a bill; to address issues bothering on restructuring. “We urge Mr. President to, henceforth, direct the EFCC to adhere to the rule of law by obeying court judgments and orders, such as the one involving Ekiti State government against EFCC and restrain itself from further political intimidation and harassment of known or perceived political opponents. “We commend the Judiciary for its commitment to the enthronement of constitutional democracy, in the face of intimidation and harassment. “We condemn in strong terms, the massive corruption going on in the management of the fuel subsidy regime, which the federal government had declared non-existent while billions of naira are deducted monthly, at Federation Accounts Allocation Committee (FAAC) meetings. disdain for the Senate, in the Magu issue, and, therefore, felt insulted.